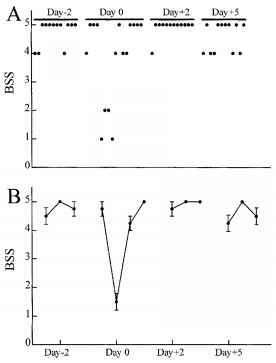 Animals are kindled using 20 or 50 Hz stimulus trains, 10 s in duration, using the suprathreshold stimulus intensity (usually 400 pA) every 5 min for 6 h, for a total of 72 stimulus trains.5,7 During this initial kindling period there is not a progressive increase in afterdischarge duration and worsening of the behavioral seizures (Figure 4.2). Most of the behavioral seizures are mild limbic seizures (score 1) with occasional seizures with a score of 2. About halfway through the day a full motor seizure (score 5) will appear. Several additional class 5 seizures will appear through the rest of the day at irregular intervals. The afterdischarge duration follows a similar pattern. Periodically there is a longer afterdischarge that correlates with the worsening behavioral seizures. Two to 3 d after the initial 1 d treatment with stimulus trains administered every 5 min for 6 h, the animals are put on an alternate day schedule (for example, Monday, Wednesday, Friday) with stimulus trains administered every 30 min. Twelve stimulus trains are given over a 6 h period. On each day of testing, the afterdischarge threshold is determined in the morning and again at the end of the day. 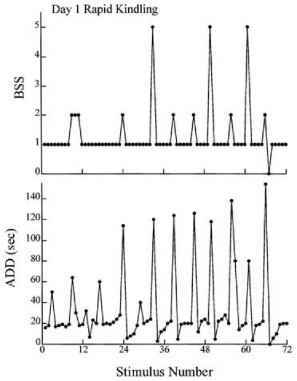 Rats often need a "priming" stimulus at the beginning of each day to express a fully kindled motor seizure, therefore 5 min after the final determination of the afterdischarge threshold, a 400 pA stimulus train is administered. The response to this priming stimulus is not analyzed. Animals are stimulated with this alternate-day protocol until a stable kindled state is reached. Here, a stable kindled state is defined as having been achieved when the animals respond to all stimulus trains with class 4 and 5 seizures and the afterdischarge durations are within 15% of each other.7 Counting the initial kindling day, it takes about 2 weeks for all of the rats in a set to reach a stable kindled state. Animals are entered into drug trials after at least three consecutive testing days (Monday, Wednesday, and Friday) of stable kindled behavioral seizures. have returned to control values. An additional 2 d are then given for recovery before the animal receives another dose of drug or a different drug. A summary of the effects of seven commonly used antiepileptic drugs is presented in Table 4.1.
a For motor seizures, + indicates the drug reduced seizures to < class 3 seizure. b For limbic seizures, + indicates the drug reduced seizures to < class 1 seizure. c For afterdischarge duration, + indicates the drug reduced afterdischarge duration at least 15%; ++ indicates the drug reduced afterdischarge duration at least 50%. Data adapted from Reference 8.
testing on one day, it takes about a week to recover normal responses after a week of every-day testing. 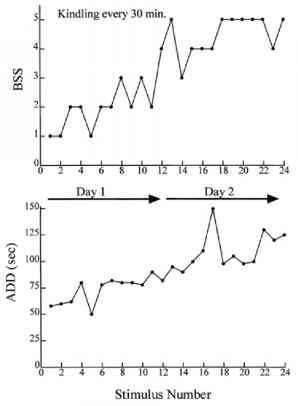 For data presentation and analysis, it is convenient to average the responses (both behavioral seizure scores and afterdischarge durations) to four consecutive stimulus trains (Figure 4.3B). Thus, results are presented as response blocks. This presentation has proven quite useful for studying the effects of antiepileptic drugs.8 Values are presented as means ± standard errors of the means and statistical analysis of the animals within one group can be done, as well as comparisons between groups of animals. Toxicity of drugs can also be determined with some simple observations. Sedation can be tested by observing the animal's reaction to sudden noises or to touch. Motor dysfunction can be tested by observation of the gait and testing of the righting reflex and muscle tone. More complicated toxicity tests (as described in Chapter 8) can be performed within the limitations of having the animal's head attached to a recording cable and the time limits (30 min) between stimulations. 2 or 10 s are administered every 30 min on consecutive days, for up to 4 d. This procedure results in a gradual and steady increase in the behavioral seizure score, until the rat is consistently having class 5 seizures in response to each stimulus train. 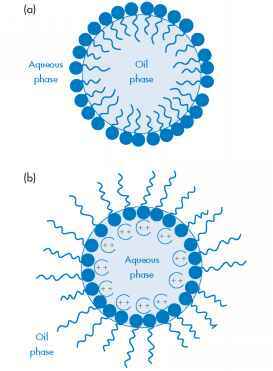 The afterdischarge duration gradually increases over the first 2 d and then plateaus at an increased level.